Summary of today’s show: This past Wednesday, the 2012 Celebration of the Priesthood dinner gathered 1,300 people to pay tribute to our priests and raise money for their continuing care through the Clergy Funds. Scot Landry and Fr. Mark O’Connell are joined by Fr. Bryan Parrish to discuss the dinner and especially an inspirational video shown during the dinner that profiled five priests, their varied paths to the priesthood, and the common denominator of the joy and peace they have felt in their vocations. 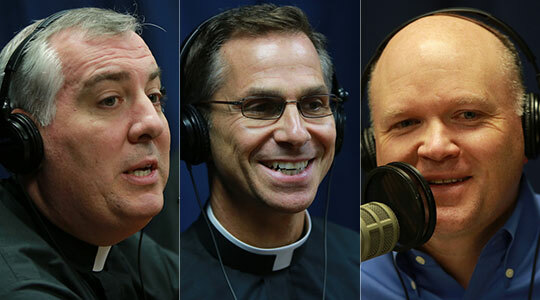 1st segment: Scot Landry welcomed everyone to the show and said the topic today is the 2012 Celebration of the Priesthood dinner this past Wednesday, which included an inspiring video profiling five priests of the Archdiocese. He also welcomed Fr. Bryan Parrish to the show as today’s guest and asked him about his impressions of the dinner. Fr. Bryan said the dinner is like a trip down memory lane seeing people that he’s known in his years of ministry and it’s a very supportive and humbling experience as a priest. Scot said in the main promotional materials for the dinner included a photo a Fr. Bryan’s hands holding his chalice. Fr. Bryan said the chalice was given to him by his parents when he was newly ordained. It is an original creation from Spain depicting the Last Supper and includes a Celtic cross and a special medallion of the Sacred Heart of Jesus that had ben given to his mother’s parents at a parish mission many years ago. The base of the chalice notes that it’s is not Fr. Bryan’s priesthood, but Christ’s priesthood he was ordained into. Fr. Mark said he also has a chalice his family gave him when he was ordained that is gold and jade. He also has his uncle’s chalice, Fr. David Delaney. The chalice includes his grandmother’s diamond from her wedding ring. He notes that when he was in seminary, his mother told him, “By the way, you’re not getting my ring.” Fr. Bryan and Fr. Mark said the inclusion of personal items in the chalice was more common in a previous generation. Scot introduced the video that profiled Fr. Henry Jennings, Fr. Jim DiPerri, Fr. Jeremy St. Martin, Fr. Bill Dunn, and Fr. Michael Harrington. 2nd segment: Scot finished the first part of the video and remarked on how it showed the diversity of the call to the priesthood. Fr. Mark said Fr. Bill Dunn was a medical doctor for 25 years who once treated now-Cardinal Timothy Dolan as a patient. Fr. Bryan mentioned that he knew that Fr. DiPerri was very involved in South Boston politics in the 1970s and early 1980s. Scot said he knew Fr. DiPerri’s parents were involved. Fr. Bryan said it also showed the different times when you can feel the time. Fr. DiPerri felt the call as a teen, while Fr. Harrington felt it after college, while Fr. Dunn felt it after a long career. Scot noted that it was through a desire to perform the sacraments that Fr. St. Martin felt the call. Fr. Mark said it’s an incredible privilege to participate in people’s live and feel the joy at their new babies. Now to the next section of the video. 3rd segment: Scot and Fr. Mark noted how unusual it is for a priest to serve for 46 years in one parish as Fr. Jennings did in St. Joseph in Somerville. Fr. Mark said it’s inspiring to see the way people responded to him. Fr. Bryan said you become a spiritual father to the people. Scot said Fr. St. Martin says that God is the God of surprises for being asked to be the coordinator of deaf ministries. He had said that the experience of that ministry still assists him in his current assignment as pastor of a parish. Scot said it inspires him to hear about how quickly priests will say yes to assignments from the archbishop that are very difficult or unexpected. Fr. Bryan said among the younger priests for whom it’s such a choice to enter the seminary or even be an active Catholic, they are very open to God’s call in whatever way it comes. It’s inspiring for him to see this commitment. 4th segment: Scot said Fr. Bill Dunn recalls how the lives of those who survived heart attacks turned around and he reflected on how the lives of his parishioners change through God entering into their lives. Fr. Mark said priests touch lives in so many ways. God takes the priest’s humble words and turns them into something that touch their lives. Scot said Fr. DiPerri said he loves being a priest and spiritual father. Also, Fr. St. Martin said his mother told him that the Church doesn’t need more priests, but more happy priests. Scot said we need more happy, holy, healthy priests. Fr. Bryan said as he was leaving the dinner this past Wednesday, in the parking garage, he bumped into the priest who was chaplain at Xaverian Brothers High School when Fr. Bryan was there. He said this priest was one of those happy priests who influenced his vocation. He was fully human and very holy. He said also that a priest himself is changed and receives so much back in those grace-filled moments. Fr. Mark noted that Fr. St. Martin said the past 10 years since his ordination have been spectacular, yet these have been perhaps the worst 10 years in the history of the archdiocese. Back to the end of the video. 5th segment: Fr. Jennings looked back over the 50 years of his life as a priest and acknowledges that in no other life would he have been happy. Scot said wouldn’t it be a wonderful thing for us to say at the end of our lives what a gifted life God has given us. Fr. Mark said an altar boy asked him recently that if God let him have a second life, what would he be. Fr. Mark replied that he would be a priest. There is no other life. This is what God called him to. He is a priest. Scot said it was shared at the dinner that the priesthood is not a job. In many ways, it’s his life. You don’t have office hours for the sacraments and the need to minister to God’s people. Fr. Bryan recalled Bishop John D’Arcy once said if you trust in Christ’s call to become a priest, then that’s everything. It’s puts everything in perspective, including the difficult times, the struggles, and the joys. Trust in God’s call to serve him as a priest and that’s the foundation of a happy life lived as a priest. Fr. Mark said he sent an email to the people in the Boston Catholic Development Services and Clergy Funds office that created the video telling them that it was brilliant in how it presented the priesthood. Fr. Bryan said it’s very emotional for him and it presents a broad and poignant and sincere snapshot of priestly life. 6th segment: Fr. Mark had a story about last week’s Gospel, in which the priest at a nearby parish had a children’s Mass. He said of the Gospel about the first being last and the last being first. He asked the kids if they knew people who thought they were better than others. He asked if they knew anyone like that. Hegot no response, so he said. “It’s a word that starts with P and then an R…” A small boy raised his hand and yelled out, “Priest!” Now as we do every week at this time, we will consider the Mass readings for this Sunday, specifically the Gospel reading. Scot said there is an echo in the Gospel from the First Reading of people who are not in the “in crowd” who are ministering. Both Moses and Jesus say that it’s people who do God’s will who are part of the “team”, not just those who wear the “uniform”. Would that all the people of the Lord be prophets. Everyone listening to the show needs to be a prophet. Fr. Mark said you see the same sentiment in Jeremiah 31 where it says that Jeremiah looked forward to a time when the law would be written on the people’s hearts and not on tablets. Our Catholic faith tells us that the fullness of Christ subsists in the Church, which means that other faiths can have access to Christ and preach Christ. Scot said the Church at its best is inclusive and at its worth it is exclusive. We pray for each other and acknowledge we are all sinners on a journey. There are tendencies in every church to be like a membership club, but that’s when the Church shrinks. Our primary focus should not be on those in the group, but should be outwardly focused. We are not called to be a club, but to be a missionary apostolate. Fr. Mark noted that at our baptism we are anointed as priest, prophet, and king, to preach and spread the faith. There many parts but one body. Scot said on Christmas and Easter when we’re crowded out of our normal pew, it’s natural to be annoyed that people aren’t there every Sunday. However, he takes solace in these readings. Those who were very close to Moses and Jesus, they had those same emotions. They were shocked that they had the same claim on those gifts. We need to be generous as an instrument of welcome, as a prophet through our actions that encourage people to come back on the Sunday after Christmas and theSunday after Easter. Fr. Mark asked what would bring someone back to the Church: A look that says you’re in my seat or a look that says it’s nice to see you? Scot said he took away from the video the joy that overflows in these priests and part of being a disciple of God is the joy visible in our lives. He then noted that Jesus talks smack at the end of the Gospel. He asked if Jesus was being literal or exaggerating to say don’t be attached to these things in our life that divide us from God. Fr. Mark noted he’s a sinner and has all his body parts and so he doesn’t think it’s literal.